Every time Rafael Nadal steps on a court he is prepared to suffer, and then to suffer some more. By his own admission, he never plays without pain. He seldom gives up, no matter how bad it becomes. His tenacity was nowhere more evident than in the final of the Australian Open earlier this year when he faced Stanislas Wawrinka and could hardly move. He had no right to win that third set, and yet he did. During injury timeout he sobbed his eyes out. The armour of his many strange habits melted away in the furnace of his suffering. Across the world, Rafa fans watched with lumps in their throats. The encounter was painful to all involved, perhaps most to Stan the Man himself who will probably always wonder whether it was a spasm or his skill that won him that title. As is his habit, Nadal congratulated his opponent, his team, thanked everyone, did not make excuses, and bowed out graciously to allow another man to bask in the glory of the moment. I suppose Wawrinka deserved it anyway for the way he nearly beat Novak Djokovic the year before, and the way he finally managed to beat him in the semi-final before facing Nadal. There is some poetic justice in that. But how much sweeter the victory could have been if, like the nineteen-year-old Juan Martín del Potro, he had beaten the world Number One and Two in top form on his way to his maiden Grand Slam title? The unbelievable final between Del Potro and Federer at the US Open of 2009 is locked away in my memory as one of the greatest matches I’ve witnessed since becoming a tennis fan. I felt just as exhausted from cheering as Del Potro must have been after that beautiful win. Ferrer is the only player I don’t mind Nadal losing to. Seeing Ferrer triumph at Monte Carlo did not hurt. When Nadal was out with injury for most of 2012 and many doubted whether he would ever play again, during a post-match interview Ferrer was asked whether with Nadal out of the game he was now the King of Clay? His answer – I’m no king, I’m David – says everything about this man who on court between points reminds me of a farmer pacing his kitchen floor, waiting for the storm to pass so that he can inspect the damage to his crops. People say that he has no weapons in his arsenal to beat the Big Four. Perseverance might not be an Isner serve or a Wawrinka backhand, but those haven’t won Ferrer over twenty ATP titles. I would love to witness him adding a Grand Slam championship to that trophy cabinet before he finally hangs up his racket and turns his attention to something just as fulfilling, potato farming or wine making. Until a few years ago, I hated watching tennis. I had a few false starts with the sport. I thought of it as an elitist pastime for Ferrari-driving snobs and rich bored housewives. When I was a child in Poland of the early 1980s, one of the girls in our street had a tennis racket (her father worked across the border in Eastern Germany), and sometimes she would let us use it. We stood in a queue and passed the racket on to one another; everyone was allowed to bounce the ball once against the side of a building. Not exactly the most exciting introduction to tennis. When I was about thirteen, Liz, a school friend in Warwick, N.Y., tried to teach me to play but she chose a day during a humid heat wave and I could barely move or see in the sun. Then, when I was slightly older, my two male cousins who played quite regularly wanted to play a trick on me and let me hit the ball against them for a few hours. My right arm was in a sling for a week afterwards. I even had to eat with my left, it was so sore. And I always remember my paternal grandfather obsessively glued to the screen whenever tennis was broadcast on TV. He watched night and day and was not amused when we interrupted. But then I met André. There are three hobbies my husband introduced me to: he asked me to listen to Anna Netrebko and Rolando Villazón and I was forever hooked on opera; he showed me the All Blacks in action and something which I’d always considered brutal and ugly became poetry; and he asked me to watch Roger Federer play against Nadal – the contrasting styles and their rivalry inspired my passion for tennis. Like André, I was a Nadal fan from the start. (Unlike André, I don’t think that his biceps are the most beautiful part of a body I’ve ever seen in a man. I like the way Nadal’s right hand moves through the air though; in slow motion and stills, there is a grace and subtlety to the way his fingers align that clashes with the sheer brutal physicality on his other movements.) We could admire the precision and beauty of Federer’s tennis, but it was the force and ingenuity of Nadal’s racket that won us over. In the meantime, Federer has also grown on us. There is no doubt in my mind that apart from the niggling head-to-head record with Nadal, Federer is the Greatest of All Times. Should Nadal add a few dozen weeks at Number One and a Slam or two to his illustrious achievements, I will reconsider. At the same time, I am not giving up on Federer to still add to his just yet, not before Wimbledon or the next Olympics anyway. 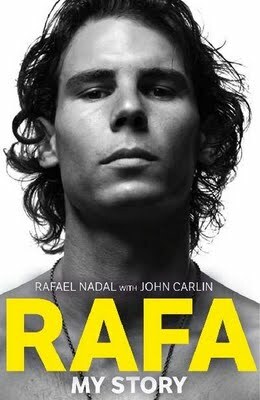 I loved reading Nadal’s autobiography Rafa: My Story, co-written with the wonderful John Carlin whose Playing the Enemy is one of the best books every written on South Africa and rugby. Rafa is also a great read, at times as tense as a Wimbledon final, but mostly an insightful analysis of the fabric of Nadal’s achievements. What moved me most in the book were the descriptions of the tightly woven ties of the Nadal family. I was reading Rafa during my parents’ divorce proceeding, so I understood immediately why it was no coincidence that in 2009 Nadal’s knees gave in at the time when his own parents were separating. Every time he plays and both his parents watch on from the player’s box, sometimes sitting next to each other and chatting away or cheering, I envy him. No achievement of mine could bring my parents back into the same room. The entire Court Philippe Chatrier would not be big enough to accommodate their pain. Nadal is an inspiration in every sense of the word. I will never play tennis myself, but whenever I am struggling to find the will to go on with my own work, I think of him and write the next word. I think of all the other tennis encounters I’ve witnessed, watching tournaments with André over the years, and take courage from them. Who can forget those last few games of the longest match ever played between John Isner and Nicolas Mahut at Wimbledon? Or that marathon Australian final between Djokovic and Nadal and the latter’s ‘good morning everyone’ during the trophy ceremony. Or Gilles Simon’s and Gael Monfils’ five-setter thriller in Australia, when from the third set onwards one was cramping so much he could hardly stand and the other’s blistered hand was dripping blood, and yet the moment the ball was in play, they fought for every single point as if it was their last. There are no losers in such matches. My everyday battles might seem insignificant in comparison but they are no less real. Watching tennis in such moments gives me strength to face my own weaknesses. And it was Nadal’s on-court magic that brought me to the sport. When he was out with injuries in 2009 and 2012, I continued watching and cheering, but something was missing. 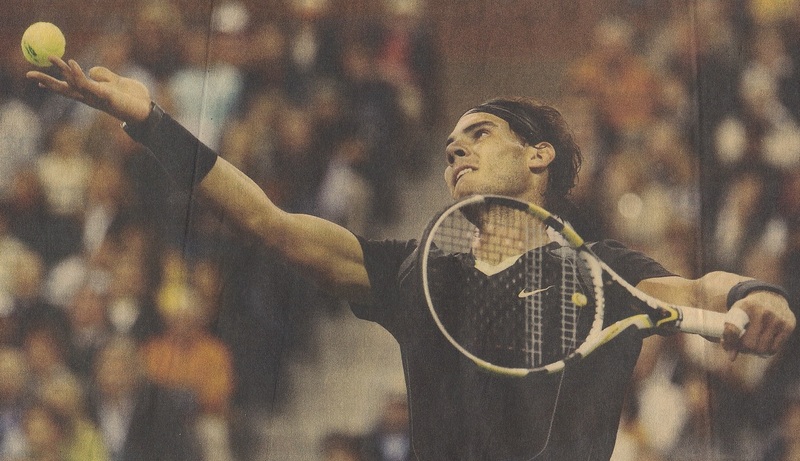 A healthy and competing Nadal at the top of his game makes my own work easier and more worthwhile. True greatness always has the power to inspire beyond its own discipline. This entry was posted in Comments, Memories and tagged All Blacks, Anna Netrebko, ATP, Australia, Australian Open, autobiography, autobiography Rafa, backhand, biceps, Big Four, blister, compatriot, competing, court, Court Philippe Chatrier, cousins, cramps, David Ferrer, divorce, family, Federer, French Open, Gael Monfils, Gilles Simon, GOAT, Grand Slam, grandfather, healthy, injuries, Invictus, John Carlin, John Isner, Juan Martín del Potro, Kevin Lamarque, King of Clay, Monte Carlo, Nadal, Nicolas Mahut, Novak Djokovic, Olympics, opera, passion, perseverance, Playing the Enemy, poetic justice, quarter-final, Rafa, Rafa: My Story, Rafael Nadal, Roger Federer, Roland Garros, Roland Villazon, Rolando Villazón, rugby, South Africa and rugby, spasm, Stan the Man, Stanislas Wawrinka, strange habits, strength, tennis, tennis players, tennis racket, titles, trick, trophy ceremony, US Open, weaknesses, Wimbledon on June 5, 2014 by Karina.